Regular readers of my VMware Storage Blog will be no stranger to Nimble Storage. I’ve blogged about them on a number of occasions. I first came across them at a user group meeting in the UK & I also wrote an article about them when they certified on VMware’s Rapid Desktop Program for VDI. Nimble Storage have been in touch with me again to share details about their new 2.0 storage architecture. After a very interesting and informative chat with Wen Yu of Nimble, I’m delighted to be able to share these new enhancements with you, in this first post on my new blog site. 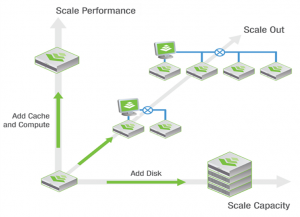 Nimble Storage’s new enhancements can be categorized into two areas. The first of these is a new scale out architecture and the second is further integration with vSphere. 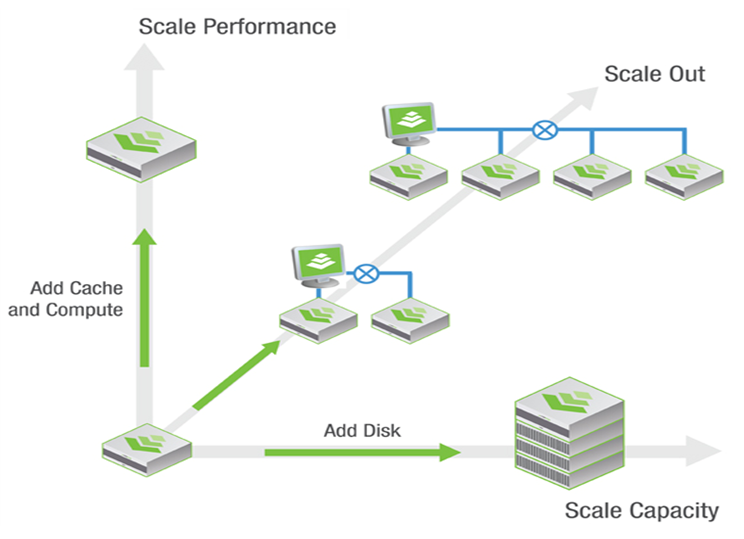 Scale to Fit architecture is how Nimble Storage describe their new elastic scaling feature. It basically allows customers to scale out their storage on a particular dimension, be it capacity or performance. This new architecture allows customers to start with a small footprint, and then to scale performance and capacity. This can be done without having to migrate any data and without any Virtual Machine/application downtime. The great advantage of this of course is that it avoids over-provisioning of storage up front, keeping initial costs down. When additional performance or capacity is needed, customers only need to grow on that dimension. This means that customers don’t pay for additional performance if they only need capacity, and vice-versa. There are 3 new vSphere integration features to call out in this new release. Nimble Storage have a new Storage Replication Adapter (SRA) for integrating with VMware Site Recovery Manager (SRM). Business Continuance and Disaster Recovery are essential features for any enterprise class storage array, and it is great to see that Nimble now offer full integration with VMware’s BC/DR flagship product. There are a number of additional VAAI offload primitives supported. The first of these is Hardware Assisted Locking (ATS) which enables ESXi hosts to offload VMFS volume locks to the Nimble storage array. The second is the UNMAP primitive, which enables VMFS volumes built on thin provisioned disks to do space reclamation after storage vMotion or VM deletion. If I remember correctly from previous conversations with Nimble, they already support the WRITE_SAME primitive. This last feature is the one I am most excited about. Nimble Storage now offer their own Path Selection Plugin (PSP) into the Pluggable Storage Architecture of the VMkernel. This optimized multipathing plugin will load balance I/O, and provide linear performance scalability with a single Nimble storage array or multiple storage arrays in a scale-out cluster. The PSP is called Nimble_PSP_Directed. Nimble Storage are a sponsor at the VMworld 2012. You’ll find them at booth 306 at the US conference this year. Could you enlighten me about the definition of ‘the WRITE_SAME primitive’ from the above article? Thanks. The best place to find out would be on the vSphere Storage Blog. Here is an article I wrote relatively recently which will provide some insight – http://blogs.vmware.com/vsphere/2012/06/low-level-vaai-behaviour.html. There are other articles there too if you do a search on VAAI. The primitives show up as unknown until a few operations are tried. I typically run a clone operation (via vmkfstools) and then use the esxcli command to check their state. check out KB http://kb.vmware.com/kb/1021976 for more info. I know this is an old post but it is the only mention of a Nimble Storage PSP that I have been able to find. Do you have more details on this? Hi Matthias, The Nimble PSP is slated for release in our CASL 2.0 release (currently in beta). Could you give us a call to get you early access (if you want to try it out before GA)? It automatically sets PSP_RR for all volumes, and set iops=0 for each path for optimal path switching.